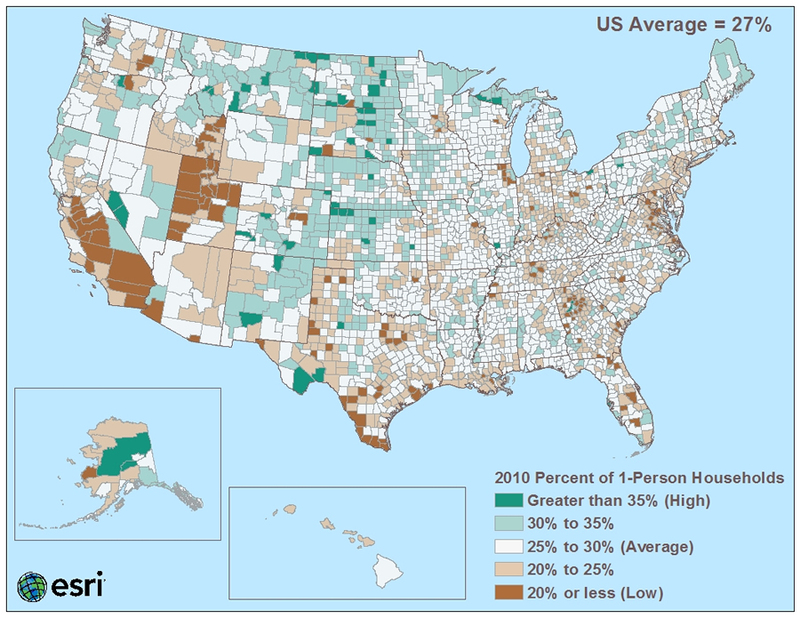 The percentage of one-person households is higher than average in some counties in states such as Minnesota, Iowa, Michigan, North Dakota, South Dakota, Nebraska, Montana, Maine, Colorado, Kansas, and New Mexico. The word selfie is now a common part of our lexicon. In 2013, Oxford Dictionaries even named it the Word of the Year. While most people define selfie as Oxford Dictionaries does (a photograph that one has taken of oneself, typically one taken with a smartphone or webcam and shared via social media), another definition is emerging. Economist Edward Yardeni uses the word selfie to describe single people who can spend on themselves or save for later because they’re not supporting a family, saving for college, or paying off a mortgage. For example, Bloomberg.com recently quoted Yardeni in a story about selfies, reporting on how at ¬125 million strong with $2 trillion in buying power—they are becoming a very coveted market. Esri Tapestry Segmentation can help businesses and other organizations identify pockets of single people, whether they are young, middle-aged, or elderly. Tapestry does this by classifying US residential neighborhoods into 67 unique segments based on demographics and socioeconomics. For example, one of the segments of singles is Laptops and Lattes [PDF]—more than 1.2 million households of thirty-something singles with a median household income of $93,000. That’s a lot of buying power, which makes them an appealing market for consumer goods and services. Food companies, for example, want to attract selfies by offering smaller portions, prepared meals, and other convenience foods. Because many Millennials snack during the day or eat out rather than sit down to meals, companies have packaged on-the-go foods. More affluent selfies eat out frequently and shop at grocery stores only for essentials. Senior citizens appreciate the smaller portions and ease of preparation. Since many selfies rent, major appliances and home improvement items don’t appeal to them; they will, however, spring for fancy coffee makers and floor cleaning appliances. Electronics are always a major necessity for younger selfies who don’t mind spending for the latest upgrades. Adventurous selfies who want to travel can find a wide variety of options. Travel, resort, and hotel companies are targeting selfies by offering themed cruises, destinations, and travel packages designed for all ages. Where can you find selfies in the United States? You can locate pockets of them in densely populated urban areas such as Washington, DC; New York, New York; and Chicago, Illinois, where young people move to find work. You will also find them in places such as Sumter County, Florida, where many senior citizens live in one-person households. Esri’s Tapestry Segmentation data includes several segments of one-person households. A few single segments are summarized below. Residents of these neighborhoods are either college students or work for a college or its supporting services. Students are busy with studies but make time for part-time jobs, sports, and socializing. They might splurge on impulse purchases such as the latest fashions. Computers and cell phones are important to them. They go online for everything. These thirty-something singles have a high median household income and cosmopolitian tastes. Many City Strivers are foreign-born. They hold on to their native cultures but also embrace American ways. They rent apartments in densely populated city neighborhoods. Most of their hard-earned wages go for rent. They work in retail or hold service jobs. Commutes are long, often on public transportation. Style and image are important, and they follow the trends and look for deals on branded clothes. For an occasional treat, they might eat out or splurge on personal services. They also spend for a cable TV package. Metro Renters are young, mobile, and educated. Many are still in college. They live alone or with a roommate in rented apartments or condos in city centers. Most of their income goes to rent, fashion, and the latest technology. They use their cell phones and computers every day. They buy groceries at Whole Foods and Trader Joe’s and shop for clothes at stores such as Banana Republic, Nordstrom, and Gap. Residents are young, either still in college or working, and rent apartments in large multiunit buildings in the city or the suburbs. Many live alone but keep in close touch with family. Most have a cell phone. They’re very image conscious and often buy clothes impulsively to look good. They’re really into music, listening to and downloading a variety of the latest music and knowing about their local music scene. Many in these neighborhoods are Millennials—young, diverse, well educated, and either finishing their education or working. They rent and live alone or share a place in densely populated areas of large metros in the South, West, and Midwest. They can’t do without their cell phones. Not brand loyal, they shop for the best price. They buy natural/organic food but will also go for fast food. They go online to bank, buy from eBay, access Twitter and Facebook, and watch TV and movies. These young, educated singles live life to the fullest, and they are not ready to settle down. They have good jobs and spend their disposable income on upscale city living and entertainment—mostly on rent. They’re connected at all times; texting and social media are essential. E-readers and tablets are preferred for everything except women’s fashion and epicurean magazines. They shop at Whole Foods and Trader Joe’s. These affluent, well-educated singles love life in the big city and hold professional jobs. Most don’t own a home or vehicle. They rent apartments close to amenities. They invest in mutual funds and contribute to retirement plans. Regular expenses include nice clothes, travel, lattes at Starbucks, organic food at high-end grocers, or treatments at spas. To stay connected, laptops, cell phones, and iPads are always on. Many people in this demographic are single and retired or closing in on retirement. Want to learn more about all of Tapestry’s segments? Esri’s Tapestry Segmentation data, available on multiple geographies in maps, reports, online, and in software, contains detailed lifestyle information about every US neighborhood.